The flows have jumped from 500cfs to 1500cfs and things have quickly changed. Due to warmer temps and rain, most feeder streams are pumping mud into the Gallatin which makes fishing a little challenging. Walk wading becomes a little more dangerous not being able to see where you're stepping not to mention the water is moving much faster. Fishing conditions conditions are a little tougher but success can still be had fishing the cutbanks, tail outs and slack waters. If nymphing, keep it simple with a stonefly pattern or bugger in front of a pheasant tail, hares ear, copper john or worm. 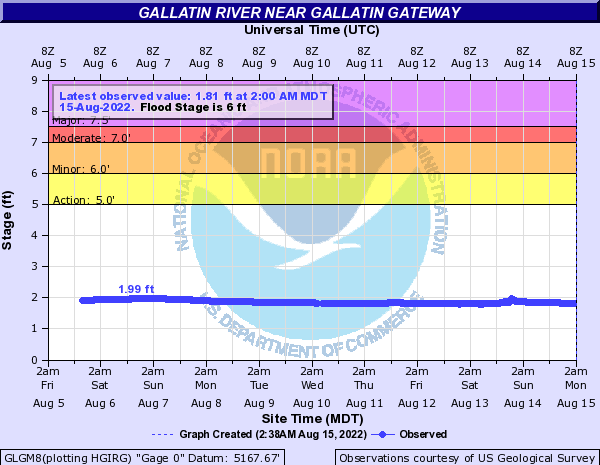 This could be a decent time to bring your streamer game to the Gallatin. Before the water changed color, white/natural patterns were the ticket, give streamers colored black or olive just creating the desired silouette to entice that fish. Keep in mind, the further down into the valley you venture, the river becomes muddier and more difficult to manage.